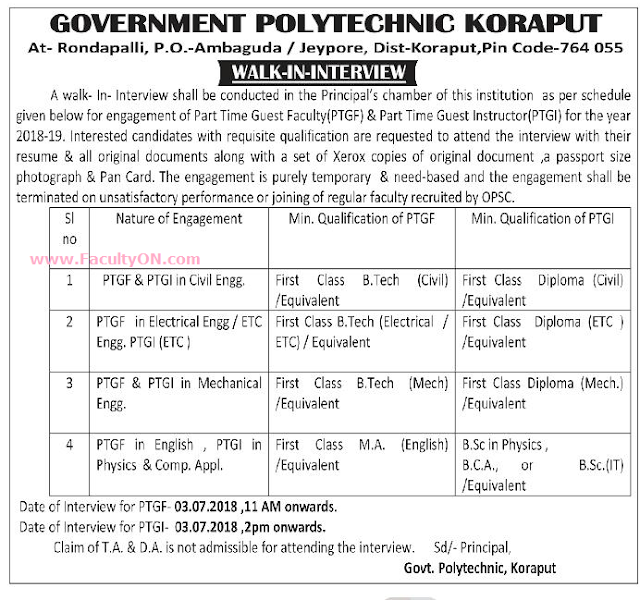 Government Polytechnic College, Koraput has advertised in the SAMAJA newspaper for recruitment of Guest Faculty Plus Guest Instructor jobs vacancies. Interested and eligible job aspirants are requested to walk-in on 03rd July 2018. Check out further more details below. About College: GOVERNMENT COLLEGE OF ENGINNERING, KEONJHAR stands in pride and honour imparting the true colours of learning and wisdom. Having its footsteps in one of the oldest Technical Institute, the Orissa School of Mining Enginnering, Keonjhar (OSME), it is only the Government College providing Engineering and Technical education in North Odisha. Government College of Enginnering, Keonjhar (GCE, Keonjhar) was established in year 1995, having Mining Engineering as the only branch and subsequently in year 1997 two more branches were added to the curriculum i.e Electrical Engineering and Mechanical Engineering. How to Apply: Interested candidates are required to attend the Walk-in interview along with originals & copies of certificates and recent PP size photo to the walk-in address given below.